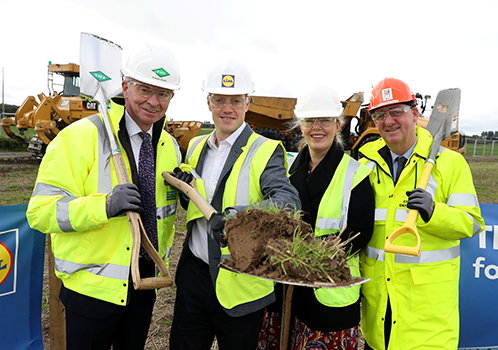 We are delighted to have been appointed as Main Contractor for the construction of Lidl’s new 58,000 m2 Regional Distribution Centre in Newbridge. Our relationship with Lidl goes back over 10 years to the Rathmines retail and residential development, and we are very excited to be working in partnership with them again on this major project. Pictured Eamon Booth, Managing Director, John Paul Construction, Alan Barry, Director of Property and Central Services Lidl, Maureen Bergin President of the County Kildare Chamber, Peter Carey, CEO Kildare County Council.